If there's one thing to be said for Curiosity's mission on Mars so far, it certainly hasn't been boring. From supposed Martian squirrels to strange flashes of light on the surface, the rover has kept us entertained. And now there's this rather odd... ball. What&apos;s That Strange Light Emanating From The Martian Surface? Although the six-wheeled rover has taken thousands of photographs of Martian rocks, the rich diversity of Mars' landscape has provided many beautiful examples of planetary geology and some geology that is downright weird. Take this recent photographic example from the Mars Science Laboratory's Mastcam camera that was uploaded to the mission's photo archive on sol 746 (Sept. 11). While compiling a mosaic of images of the surrounding landscape, Curiosity captured a rather un-Mars-like shape atop a rocky outcrop. There's a perfect-looking sphere sitting proudly on a flat rock surface. It's dusty, but under that dust it appears a little darker than the surrounding rock. At first glance it looks like an old cannonball or possibly a dirty golf ball. But knowing that Mars is somewhat lacking in the 16th-century battleship and golf cart departments, there was likely another answer. Of course it's nothing man (or alien)-made, despite what your brain might be telling you. It's another fascinating rock. 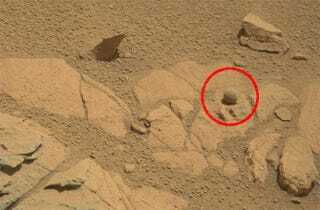 Yep, it's a spherical Mars rock. According to MSL scientists based at NASA's Jet Propulsion Laboratory (JPL) in Pasadena, Calif., the ball isn't as big as it looks — it's approximately one centimeter wide. Their explanation is that it is most likely something known as a "concretion." Other examples of concretions have been found on the Martian surface before — take, for example, the tiny haematite concretions, or "blueberries", observed by Mars rover Opportunity in 2004 — and they were created during sedimentary rock formation when Mars was abundant in liquid water many millions of years ago. By now we all know that Mars used to be a lot wetter than it is now. Curiosity quickly worked out that it was exploring an ancient lakebed shortly after it landed inside Gale Crater in August 2012. That ancient lakebed is characterized by obvious layering of sedimentary rock. On Earth, sedimentary rock is formed through the interaction of liquid water transporting and depositing material — the same process also occurred on Mars. Within the newly forming sedimentary rock, pores are inevitably created and minerals seep into those pores, gradually building up an erosion-resistant mass. Over time, as the soft sedimentary rock is eroded away, the concretion remains behind. And this little sphere is one such example — the ball has either emerged from the underlying sedimentary rock that has eroded away or, perhaps, it rolled from somewhere else over time. Now that Curiosity has reached the base of Aeolis Mons (also known as Mount Sharp), the 3.5 mile-high mountain in the center of Gale Crater, scientists are excited for the rover to begin its next round of drilling operations into the layered rock. Powdered rock samples will then be analyzed so we can gain an idea about how habitable the Red Planet was throughout its ancient history and whether or not it may have been able to support microbial life. The long two-year journey from its landing site to Mount Sharp hasn't come without its problems, however. An unanticipated amount of wear and tear by the craggy Mars surface has taken its toll on Curiosity's wheels, causing dents, punctures and rips in the thin aluminum. This has prompted rover drivers to drive the rover backwards to limit the damage and to get help from NASA's Mars Reconnaissance Orbiter to image the surrounding landscape, finding the smoothest routes. But so far, so good, Curiosity is at Mount Sharp to continue its scientific investigation into Mars' habitable history. So we can expect many more examples of interesting rocks to come, spherical and otherwise. Many thanks to JPL's Guy Webster for quickly seeking out an answer to my questions and to Paul Scott Anderson of The Meridiani Journal for tweeting a link to this fascinating photo.